Last year was a disappointing year for many investors but over at American Water Works, shareholders were celebrating. They scored a 13.5% profit last year, and have continued to swim against the market tide so far in 2016. Great news if you happen to be a shareholder in the company. Not so much, perhaps, if you happen to believe that the business of providing water to our houses shouldnt be about maximizing profits. American Water Works has been one of the biggest beneficiaries of the unwillingness and/or inability of state and municipal governments to invest in upgrading or replacing everything from aging water pipes to dilapidated sewer systems and pumping plants. The biggest loser? In the short term, undoubtedly, it is the residents of Flint, Michigan, struggling with the decision by city officials to save money by drawing water from the local Flint river instead of purchasing supplies from Detroit. The result? 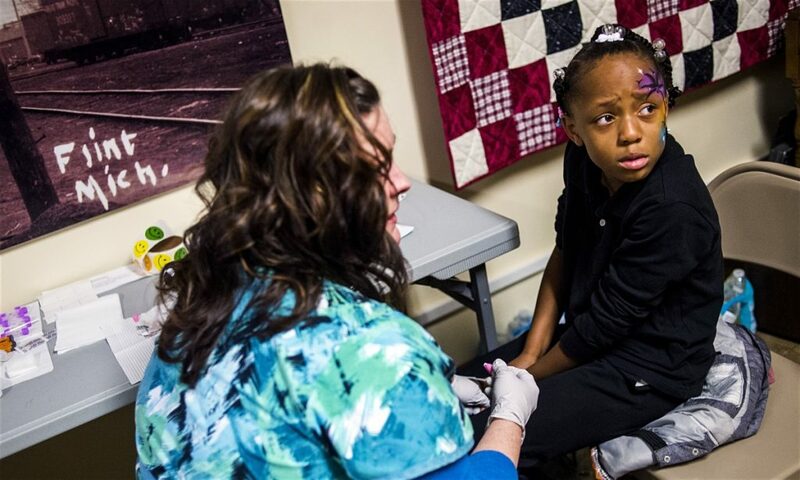 A cascade of problems, culminating in serious lead contamination that may leave thousands of children with lifelong health issues. One investigator now says that any officials found to be negligent may even face manslaughter charges, if deaths (such as an outbreak of Legionnaires disease) can be tied to the contamination. American Water Works is based in New Jersey, however, and its in New Jersey where some of these battles are likely to be fought. Almost exactly a year ago, the states governor, Chris Christie, signed into law the Water Infrastructure Protection Act. Supporters describe it as a way to avoid a Flint-style situation, by ensuring that new investment flows into ageing water infrastructure systems, one way or another. The problem is that to accomplish this, the law enables municipalities to bypass what had been the requirement to obtain citizens consent to sell off municipally owned assets in a public referendum, as long as they can prove their system is deficient. Anyone who objects has a mere 45 days to collect signatures from 15% of voters to demand a vote on the issue. In the same year that Christie put together a five-person privatization task force (two of whose members had ties to the water industry), the citizens of Trenton, New Jersey, had turned thumbs down on a proposed $80m takeover of their water system by a subsidiary of American Water Works. Now, citizens of other municipalities whose systems are struggling, like Atlantic City, will have almost no say in the matter. Thats especially true since Christies budgets have cut funding for environmental programs; some of those monies could have gone to assist cash-strapped municipalities in repairing their water systems. The appeal of privatization to municipalities struggling to balance their budgets isnt hard to see. They get to transfer one big headache to someone else to deal with, dust their hands, and move on to address the next problem. And its up to companies like American Water Works to make it all come together: to invest the capital required, upgrade the systems, and generate a profit. And there are all kinds of issues that arise in connection with that. First of all, while the municipality will end up with a better water system (we hope lets assume thats the case), residents also will be paying for it in the shape of higher water rates. If the city couldnt afford to make those improvements before, what will have changed? Not much. Yet the regulators will approve rate hikes for the water utility based on the amount of capital invested, whether or not they are affordable. And one study by Food & Watch found that investor-owned utilities charged rates that were an average of 33% higher for water and 63% higher for sewer service than those levied by government agencies. In part, thats because a corporation pays more to finance its infrastructure investments, since it cant issue tax-free municipal debt at lower interest rates. Living in North America, many of us have become accustomed to the privilege of turning on a tap and finding ourselves rewarded with a stream of fresh, clean water. We forget that it is a relatively recent phenomenon something that even our great-grandparents may have found astonishing and in spite of sharp price increases in recent years, even in California, some residents still call their tap water one of the biggest bargains imaginable. While its not likely that well see a repeat of the kinds of scenes we witnessed in Detroit when thousands of people had their water cut off due to their inability to pay their bills its certainly conceivable that a bill that once was a minor expense could suddenly become anything but, especially if privatized utilities take the lead in upgrading our water systems. Utilities of all kinds are discussing the need to raise their rates to cover the cost of financing infrastructure improvements. Its tough enough when those utilities arent private corporations with an incentive to maximize profits, but city departments. Even then, citizens in cities such as Baltimore and New York are in financial peril and losing access to their water supplies. Throw the profit motive into the mix, and things could get worse. What happens if those for-profit utilities have too many delinquent bills, and shareholders are unhappy? The pressure will be on to cut costs, which could result in some of the same problems that prompted the sale in the first place. Water isnt a private commodity, but a necessity of life, making access to it a public good. And steps need to be taken to ensure that access remains open, not to install toll gates and barriers. Barack Obamas decision to seek an 18% boost in the state drinking water infrastructure fund, raising it to $157m in fiscal 2017, is a good concept, but its a drop in the bucket. Somehow, there needs to be a willingness to assist municipalities in funding these infrastructure investments, so that theres no need to resort to private corporations and enable a handful of investors to profit from our need for clean water. If that cant come in the form of direct assistance, it could be in the form of loan guarantees that would enable municipalities to raise capital more inexpensively on the open market. Anyone absolutely determined to make money by trading in clean water securities could buy those bonds rather than speculate that policies like those of Chris Christie will make American Water Works a winning stock to own. It isnt that there is no role for the free market in water, either. Venture capitalists are backing technology companies that monitor how water is used and try to ensure that an increasingly scarce resource isnt squandered; they are financing de-salinization, wastewater treatment and other water recycling technologies. Thats where the business risks are being taken, and thats where its appropriate for a for-profit business to look in pursuit of profits not in the bare bones business of getting water safely through pipes to our taps.